Programs offered BBA,B.com, BA, MBA, PGDM, MCA, MA, M.Sc and more. Why Distance Education at LPU? Lovely Professional University (LPU) is a private university established by Lovely International Trust, under The Lovely Professional University Act, 2005 in the year 2005. It is situated in Jalandhar, Punjab. Felling the lack of distance education in the country the university started its distance education programme in 2007. LPU Distance MBA program is one of the top-ranked distance education programs in India. 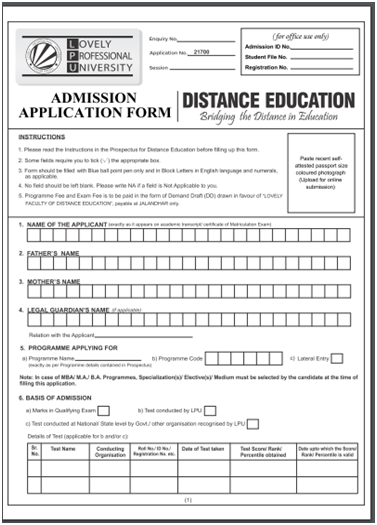 The distance programme of the university is recognised by the University Grants Commission- Distance Education Bureau. Students can apply by offline mode only. For applications, students have to buy the LPU Prospectus from the division of admission at the university campus or such other locations as the university may specify. The cost of the prospectus is INR 350. Students can also download from the official portal of the distance education section of the University. Admission into certain regular courses is based on the score of LPUNEST Exam. The institute also accepts scores of other entrance tests like CAT Exam, CMAT Exam, MAT Exam and others. The application form is available with the prospectus and the applicants must fill in every detail that has been asked and in case any field is non-applicable candidates must fill it with N/A. The applicants must submit the following documents, both self attested and attested by a competent authority along with the application form. The applicant must remember that his/her signature on the application from and all other testimonials that he/she submits, should be authentic and the same should match with the proof of signature furnished by him/her. Programme Fee and Examination Fee for 1st Term/ Year should be paid through Demand Draft drawn in favour of “LOVELY FACULTY OF DISTANCE EDUCATION”, payable at JALANDHAR. For subsequent semester(s)/ year(s), the student shall pay the programme and examination fee online through interface available on his/ her LPU e-Connect account. Programme Fee for 1st semester/ year will be payable at the time of Admission. Fee for all other semester(s)/ year(s) will be payable as per the schedule prescribed by the university before the start of End Term Exam of corresponding semester/ year. Examination fee will be payable along with the programme fee. Students, who want to take printed Study Material, are required to pay Study Material Fee at the time of receiving the Study Material. It must be remembered that the university does not accept any payment in cash and it will not be held responsible for any kind of fraudulent cash transaction. The following tables show the fee structure for the different courses offered at LPU Distance education. The total LPU Distance MBA fee is around Rs 22,000. The program and examination fee for the 1st semester/year needs to be paid at the time of admission. All candidates have to pay the examination fee along with the program fee. Buying the study material is not mandatory for the candidates. It is important to remember that the university does not offer any kind of scholarship or financial assistance to its students. The eligibility criteria for any bachelors level course is passing of 10+2 in any stream or relevant stream as per the course. The graduation in any discipline or equivalent. The candidate needs to complete a diploma in the relevant stream (3 years after 10th class or 1 year after 12th Class) from a recognised institution. Lovely Professional University has a placement cell under the Division of Student Career Services to equip students with versatile traits to match core needs of the corporate world. This division acts as an intermediate between the corporate world and the university by providing the budding students with guidance in their choice of career and an easy access to employers for providing ample opportunities for Placements. Students are provided with placement support by informing them from time to time about various placement drives to enable them to avail the opportunities. Policy Bazaar, Kotak, Indigo, LIC, Videocon, Bajaj are some of the top companies that have recruited from Lovely Professional University Distance programme.